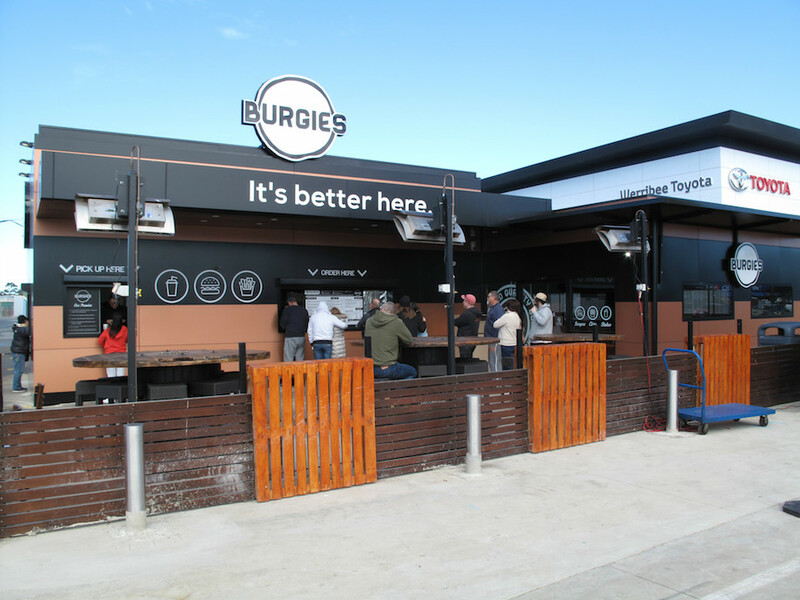 Burgies in Hopper Crossing is a sibling to one in Campbellfield. The photos we’ve seen suggest an outdoor and rather rustic operation, so we’re not at all sure how we’re going to go on a sunny Sunday that is also windy and chilly. 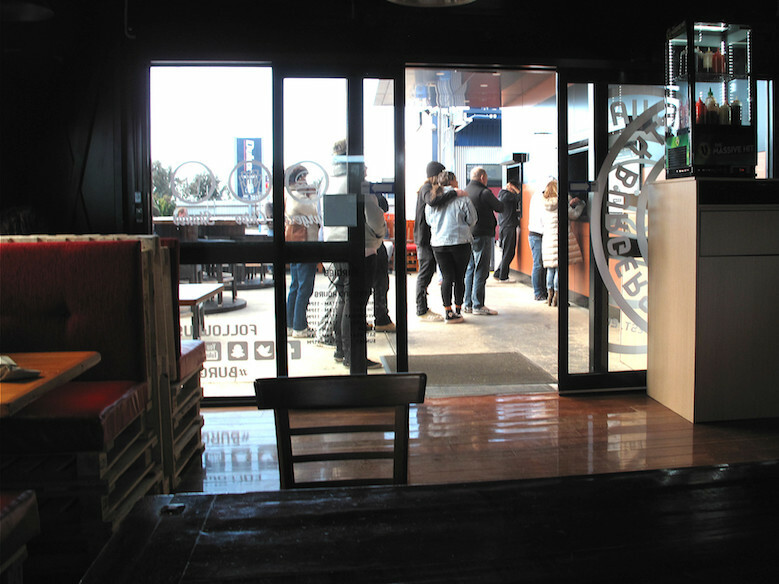 After scoping the place out, we relax … having discovered that while orders are indeed processed outside, right next door is a big, warm and rather inviting dining room, its fittings seemingly niftily constructed from packing pallets. And whatever the meteorological challenges of ordering and dining amid the glorious tack of the Golden Mile, the place is doing very, very brisk business. This is a popular joint. The happy staff members are cheerful, chatty and efficient; the wait times about what you’d expect. 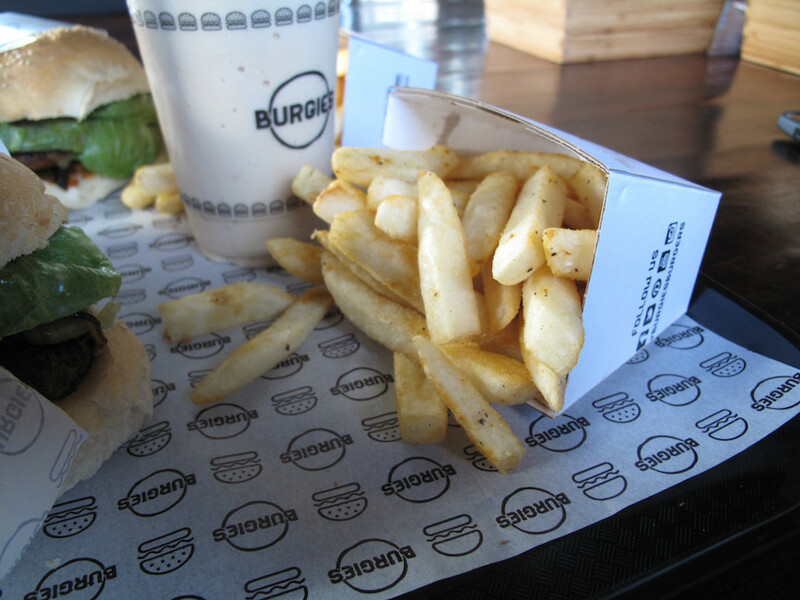 We order, pay and settle in for what we hope will be a good burger repast. The menu and its lowish prices suggest solid and satisfying – and that’s pretty much how it goes for us. The chips ($4.50) are orthodox, hot and good. 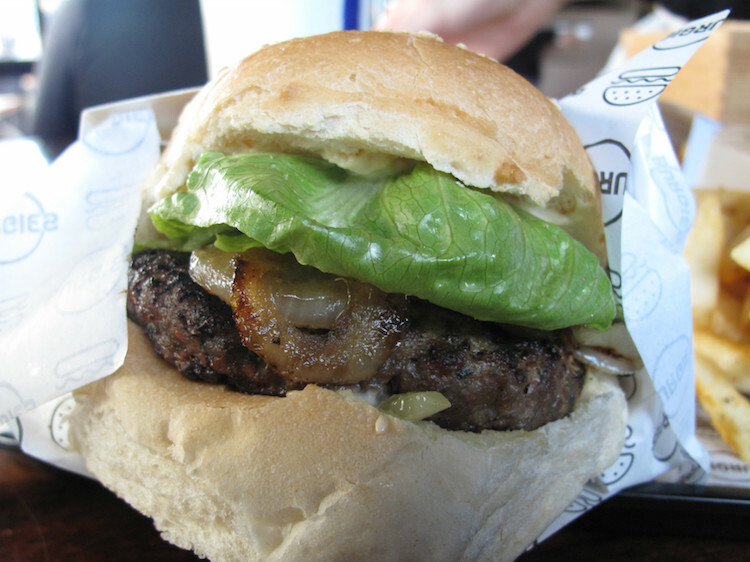 My Kefta Burger is definitely the big winner of our meal. 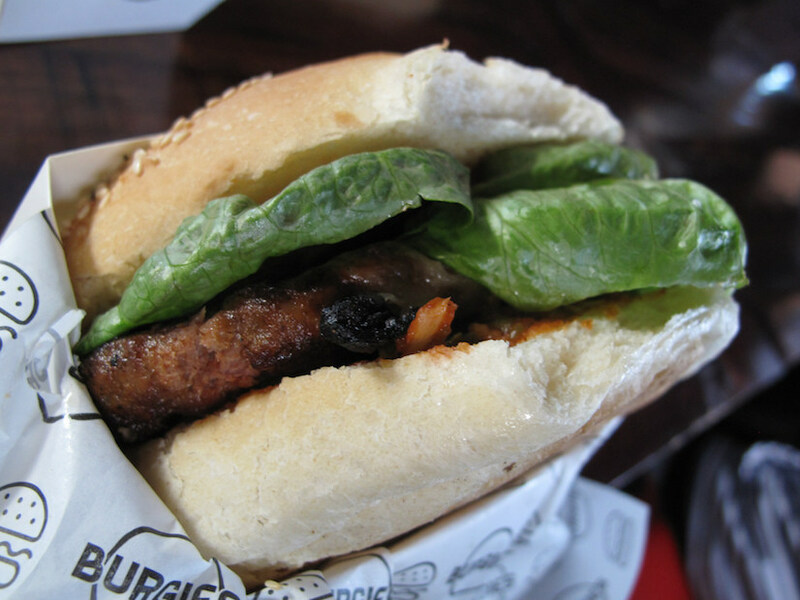 It has lamb patty, cos lettuce, caramelised onions, pickles and “humus sauce” – and it’s beaut, especially given the $9.50 price tag. Bennie is less enamoured with his Flaming Burgie ($11) of beef, cheese, cos lettuce, tomato, jalapeno, tomato sauce and chilli salsa. The parts are of sufficient quality, but he finds the sum to be just average. He even utters the dread phrase “frozen patty”. Now, I hasten to add he has no factual detail at hand to back up such a slur, but it does convey something of the meh moments he has with his burger. 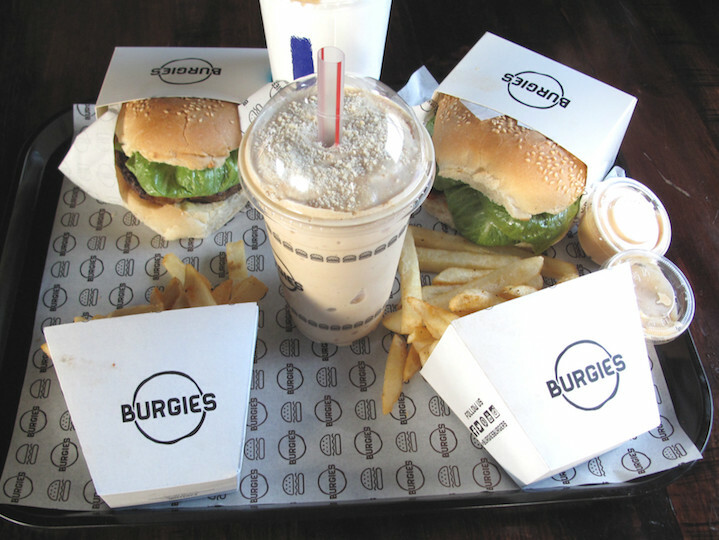 So for him, the highlight of our Burgies sojourn is his caramel biscotti gelato thickshake. When/if we return, we may well order from the chicken burger list, as a poultry pair we observe being consumed at the next table look pretty darn good and better than either of ours.